ryan griffis | Sun Apr 2nd, 2006 5:22 p.m.
ryan griffis | Sun Apr 2nd, 2006 5:37 p.m.
Networked Publics, the research group that I've been leading, together with Mimi Ito, will be holding an end of the academic year conference this April as a milestone toward the production of a collaboratively written book on the topic. ryan griffis | Sun Apr 2nd, 2006 5:40 p.m. Currently, there is much advocacy for cultural practices that demand a particular involvement on the part of the audience, creating situations in which art projects are co-produced. People interact with networked computer systems and artifacts evolve out of experimental relationships between several people. The media art curator is not exclusively the "middle person" between artists and museums or galleries anymore. Curators do not merely organise exhibitions and edit, filter and arrange museum collections. Now, her practice includes facilitating events, screenings, temporary discursive situations, writing/publishing, symposia, conferences, talks, research, the creation of open archives, and mailing lists. Curators become meta-artists. They set up contexts for artists who provide contexts. The model of the curated website has become a useful recognition mechanism. In media art many cultural context providers function in various registers including that of the curator. However, the once clear line between curator, artist and theorist is now blurred. In this post, quoted from above, Trebor Scholz also discusses the Institute for Infinitely Small Things as an example of artists playing "Cultural Context Provider." Marisa Olson | Sun Apr 2nd, 2006 11:21 p.m.
Nottingham-based technology artists, Active Ingredient (authors of 'Ere Be Dragons), are to launch an interactive game that will link the people of Leicester, Nottingham and Derby. Love City will allow people to text each other in a game that awards points for making connections with people from the other cities. The game uses mobile cell location to track users' positions in the three cities. When a player moves between mobile phone 'cells', s/he (Player 1) receives an SMS that includes an update about Love City and the status of other players in their area or in one of the cities. Players can then connect with each other by sending a text to another person in another place. 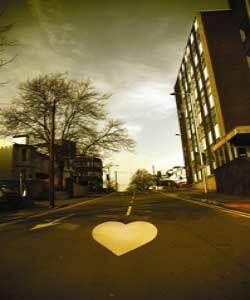 If Player 2 accepts Player 1's message of love, a connection is made and these form a "bonded pair". If a second connection is made from this group to a third player, then a triplet or Ménage à trois is created. When a triplet is formed, Player 1 is awarded an avatar known as the "offspring" which acts as an agent for them in this particular cell. Subsequent connections with this agent are relayed to the original player who may be far from the cell but can still connect and initiate a process which leads to the creation of more offspring and points for them. Thus their empire grows. The first test of the game, commissionned by Three Cities, will take place on April 3-9 2006. The full-scale public project is likely to take place at the end of the year when a big-screen projection of the game will be broadcast in the main public spaces of each city. Via Media Arts Education. Background information from 24hour museum and Three cities. Marisa Olson | Sun Apr 2nd, 2006 11:57 p.m.
Toronto Star: Dice and splice artists step up to throw-down. While terms like remix and mash-up are more readily used to describe the sampling and cut-and-paste movement in the audio world, video artists are increasingly slicing, dicing and reconstituting to create something new. Today's Videodrome 2 event at the Museum of Contemporary Canadian Art further busts open the frame. Four groups will perform a live throw-down of their audio-visual art, a real-time twist on the typically taped displays. "The concept is a video battle, which is like the traditional deejay battle or emcee battle, with people who make video and audio at the same time. It's four crews squaring off against each other in a tournament and basically they're trying to outdo each other by showing a better video," says Jubal Brown, one of the five members of Toronto contingent Famefame, and an organizer of the event. Rhizome | Mon Apr 3rd, 2006 8 a.m.
J.J. Toothman | Mon Apr 3rd, 2006 5:09 p.m.
MAKE Flickr photo pool member Oskay2 writes - "Dining table with a frosted glass top lit by 448 LEDs that respond, in a complex and gentle fashion, to input generated by motion above the table while we eat. This will be demonstrated at the MakerFaire in April 2006." - Link. Related: So many LED projects, so little time - Link. Greg J. Smith | Tue Apr 4th, 2006 12:40 a.m.
Quite possibly the most practical video game of the year. It is a nonviolent strategy game where events have been taken directly from our contemporary history and players must overcome mass conflict using practical (read: nonviolent) techniques and abstract planning savvy. If you're not ready to rise up just yet then it may be prudent to play this while you remain sedentary. Marisa Olson | Tue Apr 4th, 2006 7:34 a.m.
Kunstradio, a radio art program of the ORF, Austria's national broadcaster, is featuring a weekly series of radio miniatures by Nerve Theory throughout 2006. 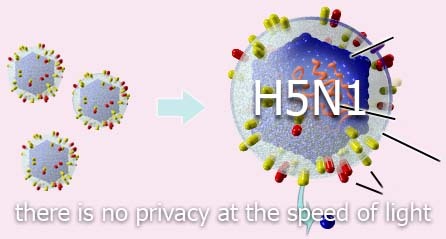 The series is called "H5N1: there is no privacy at the speed of light." Nerve Theory is the corporate identity of Bernhard Loibner and Tom Sherman. Nerve Theory's latest work focuses on the bird flu virus, H5N1, and the hysteria surrounding the inevitable global influenza pandemic. Loibner and Sherman use the idea of the evolving, mutating H5N1 virus as a launching pad for a series of scary, strangely funny statements about the world we live in. Imagine a world where artists write and deliver the news. Loibner and Sherman are not scientists, but they are experts in observing and describing media viruses and a delivering broad spectrum of living, evolving ideas. Listen for this sound logo: "H5N1: there is no privacy at the speed of light." This logo will mark updates on the journey of the H5N1 virus as it mutates into a mix of creatures that violate our privacy and threaten our lives. Nerve Theory's H5N1 radio miniatures will pop up from week to week in Kunstradio's regular programming throughout 2006. Kunstradio is now infected. Check your own status. Tune into Kunstradio. Marisa Olson | Tue Apr 4th, 2006 7:50 a.m.